'Waiting To Exhale: Original Soundtrack Album' Is A Transcendent Celebration Of Womanhood The album, with its star-studded tracklist featuring only women, isn't just one of the most successful soundtracks ever made, but a beloved, standalone R&B album. 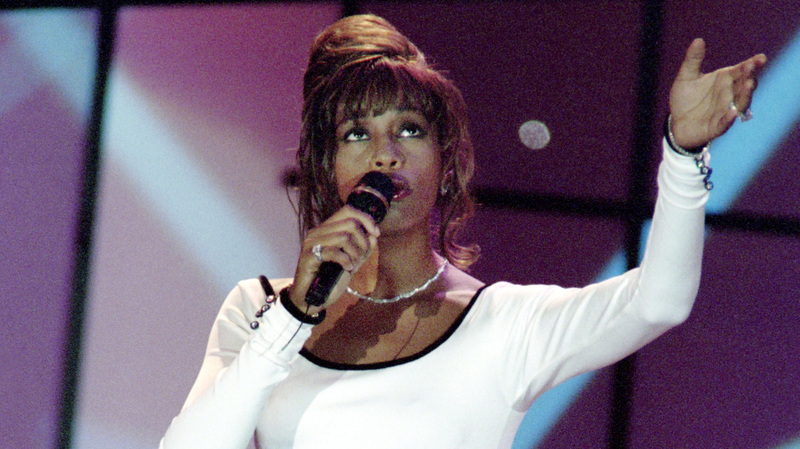 Whitney Houston (shown here performing in 1994) starred in the movie Waiting To Exhale, and contributed several songs to its breathtaking, beloved soundtrack. This essay is one in a series celebrating deserving artists or albums not included on NPR Music's list of 150 Greatest Albums By Women. In the early 1990s, a Hollywood film led by women was rare but visible (see: Steel Magnolias; The First Wives Club). But a Hollywood film led by black women was nearly unheard of. Enter 1995's Waiting To Exhale. To more cynical eyes, the Terry McMillan New York Times-best-seller-turned-film was little more than an attack on men, but for women (and especially black women), it was a chance to see modern versions of themselves represented on the big screen. The leading ladies — an ensemble cast of Whitney Houston, Angela Bassett, Loretta Devine and Lela Rochon — are middle-class, professional friends navigating their way through muddy relationships and situation-ships (or, in at least one case, trying to even feel worthy of one). It was a revolutionary release that predated films like Set It Off all the way through this year's standout Girls Trip. The soundtrack to Waiting To Exhale, however, remains a moment unmatched in the years since, set apart by its star-studded tracklist featuring only women. Director Forrest Whitaker enlisted Babyface, renowned architect of '90s R&B, to compose Waiting to Exhale: Original Soundtrack Album. At the time, soundtracks were as much an occasion as the films they were made for — an opportunity to cement a movie beyond the box office. The very best soundtracks, though, took on lives of their own. With this in mind, Babyface took a risk when he opted to have women take the entire spotlight on the soundtrack. With Whitney Houston having the final say in the curation process, the gamble paid off: Released in November 1995, the album topped the Billboard 200 for five weeks and sold over 7 million copies in under a year, making it one of the best-selling soundtracks of all time. On the awards front, it cleaned up everywhere from the American Music Awards to the Soul Train Awards; it also earned 11 Grammy nominations, including one for Album of the Year. Within all this acclaim, most critical praise was heaped on Babyface's original songwriting and production prowess, rather than on the women's performances. But these women were stars in their own rights who showed up and showed out, bathing the movie in emotive R&B that could stand apart from the screen. Waiting to Exhale: Original Soundtrack Album embodies what a soundtrack can be: not just a star-studded compilation tied together by a film, but a collection of artists in conversation with each other, relating from one track to the next. The bittersweetness contained within its 73 minutes is profound and complex — a spectrum of experiences for and by women. Aretha Franklin's "It Hurts Like Hell" channels all the pain implied in its title. It's not the bitter scorn of setting a car on fire, but rather the sorrow of lying in a king-sized bed alone for the first time. With 40 years of vocal virtuosity on display, the pacing is perfect; every lyric sounds like it's actively surviving. Then there's Mary J. Blige's post-breakup diatribe "Not Gon' Cry." Smoldering and insistent, it would become her most successful single at the time, earning her the No. 2 spot on the Billboard Hot 100 and a platinum plaque. It remains one of her most iconic songs to date. Brandy also earned her highest-charting song to that point with "Sittin' Up In My Room," a girlish crush daydream apt for the soundtrack's youngest voice while, elsewhere, sensuality oozed from Toni Braxton's signature husk on "Let It Flow" — another chart-topper from the soundtrack. Finally, after the totality of love's waves have crested and crashed, the music returns to its core theme. The album, like the movie, was never truly about men or heartbreak. It highlights, instead, the platonic love between women and the way we pick up the pieces and put each other back together. The soundtrack's opener, "Exhale (Shoop Shoop)," finds Houston scaling back; she's refined and elegant as she finds her peace with life's ups and downs. "When you've got friends to wish you well / You'll find a point when you will exhale," she sings. The sentiment comes full circle on Houston and CeCe Winans' "Count On Me" — a warm-hearted duet about restorative sisterhood shared between two masters of their craft and real-life longtime friends. It's the most sentimental song on the soundtrack and an esteemed accomplishment by itself, peaking at No. 8 on the Billboard Hot 100 and earning Winans her first top-ten hit. That a song celebrating friendship between women performed so well in a society that often seems to champion narratives about cattiness made its success all the more sweet. As a whole, Waiting to Exhale: Original Soundtrack Album was an impeccably cohesive merging of R&B styles and a convergence of past, present and future stars. Legendary divas like Franklin, Patti LaBelle and Chaka Khan were side by side with a teenaged Brandy and Faith Evans — who was just a few months removed from her debut single, the ink on her Bad Boy contract barely dry. Houston was a full-fledged superstar riding high on the triumph of her 1992 soundtrack for The Bodyguard (the highest selling soundtrack ever), sharing space with the quickly-blossoming Braxton and Blige. SWV and the genre-bending TLC represented for the girl groups, alongside quartet For Real who, despite having a memorable ballad with "Love Will Be Waiting At Home," disappeared into relative obscurity after releasing its final album the following year. The result was effectively a torch-passing as much as an acknowledgement of how powerful and important women — black women — are both as humans and musicians. It isn't just one of the most successful soundtracks ever made, but a beloved, standalone R&B album. It's a transcendent celebration of womanhood that remains refreshing and important nearly 25 years after its release, and a landmark occasion in pop culture history that hasn't been recreated since.